Danish drama from the 'Dogme' school of filmmaking, directed by Thomas Vinterberg. Danish drama from the 'Dogme' school of filmmaking, directed by Thomas Vinterberg. Danish drama from the 'Dogme' school of filmmaking, directed by Thomas Vinterberg. The wealthy Helge Klingenfeldt (Henning Moritzen) and his wife Elsa (Birthe Neumann) throw a family party to celebrate his sixtieth birthday. Eldest son Christian (Ulrich Thomsen) and daughter Helene (Paprika Steen) arrive, as does reckless younger son Michael (Thomas Bo Larsen) - in disgrace through his failure to attend sister Linda's funeral months earlier. Maids Pia (Trine Dyrholm) and Michelle (Therese Glahn) both hope to rekindle their old affairs with the two brothers, but their efforts prove to be in vain. At dinner, Christian announces that both he and the late Linda were sexually abused by Helge when they were children, but is not believed. However, while staying in Linda's old room Helene discovers a suicide note from her sister which forces her to reconsider. Danish drama from the 'Dogme' school of filmmaking, directed by Thomas Vinterberg. The wealthy Helge Klingenfeldt (Henning Moritzen) and his wife Elsa (Birthe Neumann) throw a family party to celebrate his sixtieth birthday. 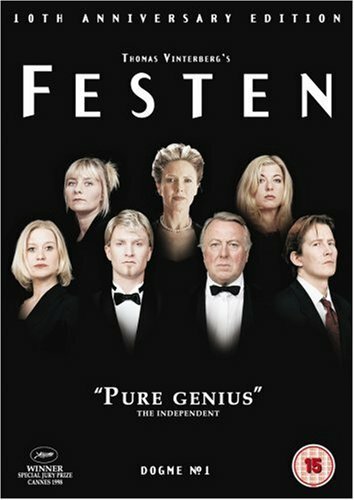 Eldest son Christian (Ulrich Thomsen) and daughter Helene (Paprika Steen) arrive, as does reckless younger son Michael (Thomas Bo Larsen) - in disgrace through his failure to attend sister Linda's funeral months earlier. Maids Pia (Trine Dyrholm) and Michelle (Therese Glahn) both hope to rekindle their old affairs with the two brothers, but their efforts prove to be in vain. At dinner, Christian announces that both he and the late Linda were sexually abused by Helge when they were children, but is not believed. However, while staying in Linda's old room Helene discovers a suicide note from her sister which forces her to reconsider.